Our Nebrodi Black Pig Lard has a white and rosy colour. Consider that you want to eat it only for its aspect. Let me explain that people in the past considered the lard as a noble part of the pig, think for a moment it is nothing more that the fatty part of the back of the pig. But this is what makes it a precious product. 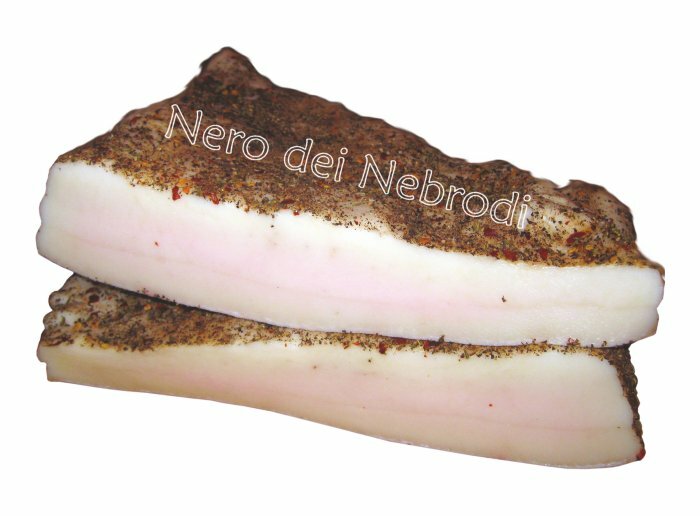 The Nebrodi Black Pig lives free ‘en plain air‘. So the absence of an intensive raising and grazing make his meat better. Its lard then is devoid of bad cholesterol and contrary to how it is thought it does not have a high caloric intake. Fresh, with an exquisite sweetness. It carries in itself the smell of aromatic herbs and spices. Spread it on toast or with soup and beans, or with a side of potatoes! As you can notice, the choice of mixes is really vast. And do not forget the pairing with polenta. Appearance on slicing: It slices with a homogeneous and uniform cut and is white or slightly pink in colour.